It seems an exhaustive list. Yet Roderick selected Lawson’s 1892 story The Drover’s Wife for the collection too, and it alone has three Indigenous characters, primarily a lazy, lying “stray blackfella” whose actions bring the stoic frontierswoman to tears. It appears Lawson did attempt to draw people he didn’t know – Roderick just didn’t see them. In this literary continuum, the post-colonial retelling of The Drover’s Wife by actor and writer Leah Purcell is an important work. It pauses history’s accretion of half-truths and delivers our cherished classics back to us, alive with a new muse. Purcell is a Goa-Gunggari-Wakka Wakka Murri woman. 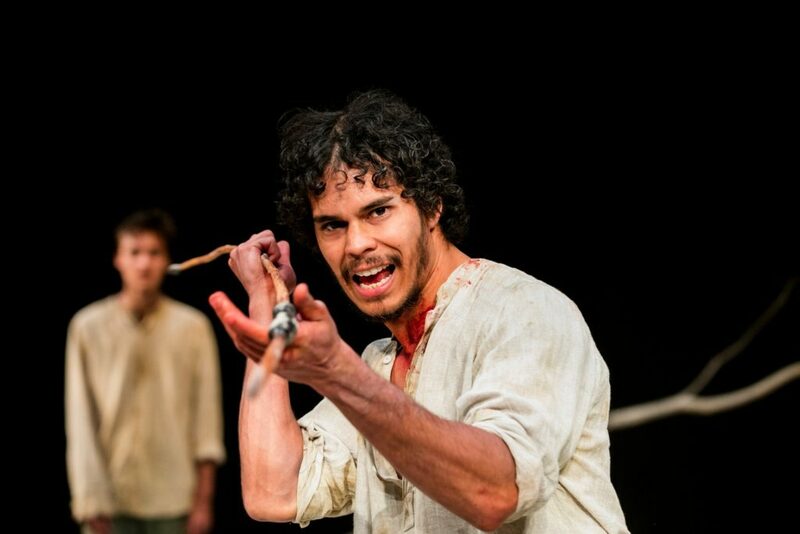 In her version of The Drover’s Wife (in which she plays the titular character), the lying blackfella is reimagined as the honourable Yadaka (Mark Coles Smith) in a co-leading role. Two female Indigenous characters appear only in spirit form or anecdote but are nonetheless crucial to the action . And in a plot twist I won’t spoil, one that spins the entire play on its axis, a fourth Indigenous character looms largest of all. The play has plenty of action. Purcell calls it an Australian western influenced by Deadwood and Django Unchainedand while Stephen Curtis’s stage design is minimal – a dead tree, a wood block, a grubby curtain – Tess Schofield’s costumes are faithful to the era. 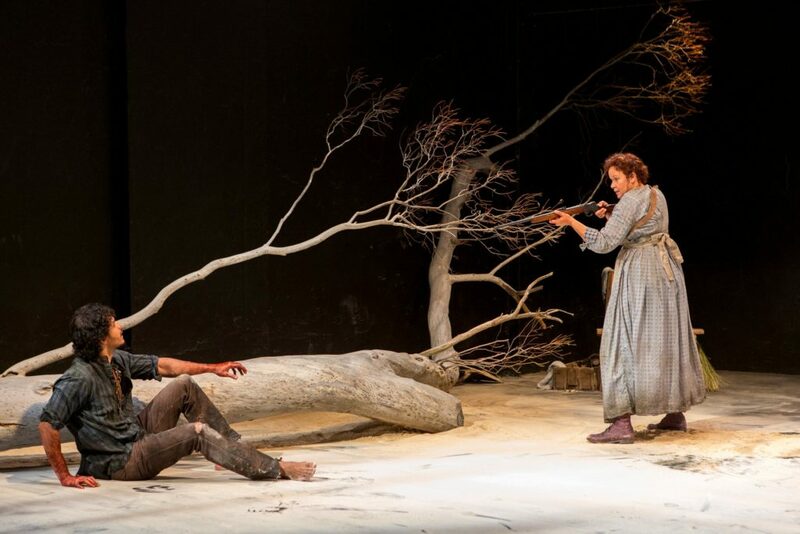 The play opens with the drover’s wife in tattered, full skirts pointing a rifle at a black man lying on the ground, possibly dead. She circles him and calls for her dog. Instead, a no-good swagman (Tony Cogin) arrives saying there’s a murderous black felon on the loose. Did I mention the drover’s wife is in labour, wracked by contractions? The black man is Yadaka and he is not dead. Like the drover’s wife, he is an underdog and a survivor: taken as a kid to join a circus, fleeing the horrors of a clan killed by poisoned waterholes and trying to return to his mother’s country across land now criss-crossed with fences. Yadaka and the drover’s wife share stories, at first falteringly, then freely. Before him, her uterine waters splash to the floor; later, useless breast milk darkens her dress. Her body teems with life and death, as women’s bodies do, and Yadaka seems not disgusted but in awe. “In my tribe you would be treated like a queen,” he says. “This is a story about women’s business,” says Aunty Bronwyn Penrith, a Wiradjuri woman and chair of Mudgin-Gal Aboriginal Women’s Corporation, when she opens the play. “Aboriginal women, but also colonial women and what they went through.” Her words bring us close to a fresh source of reconciliation. Smith brings so much to his role as Yadaka: gentleness, charisma, optimism and romance. He delivers the script’s most poetic lines with ease. “Her skin oiled with Bogong moth fat, shining like a full moon,” he says of first seeing his wife. “When she danced … smooth like shallow runnin’ water over river rocks.” It’s captivating – perhaps because I’ve never heard an Aboriginal woman described so beautifully by an Aboriginal man in an Australian play. In Lawson’s story, the wife’s foe is a snake. She also recalls battles with fire, flood, a buffalo and a “gallows-faced swagman” who expresses his “intention to stay the night”. In Purcell’s feminist reworking, men like the swagman are the primary threat. “Snakes, missus,” warns Yadaka. “Least of my worries,” she snaps back. Director Leticia Cáceres’s staging works brilliantly to make this point. Ill-willed men pop out from every available entry as though lurking opportunistically in the perimeters all along. A swagman, a peddler (Benedict Hardie) and a trooper all enter, uninvited, from different points. Leading into the most harrowing scene, two drovers inexplicably emerge from the wife’s shanty. Her defences are constantly being breached but this time you feel she is surrounded; done for. My only gripe is all the gun-pointing. Fear of a gunshot does maintain audience tension but it seems a cheap way to do it. We discover her name is Molly. She prefers the drover’s wife, though not out of loyalty. As Lawson wrote, the drover “may sometimes forget he’s married” – a flaw that is brutally extrapolated by Purcell. Even with Yadaka by her side – who wilts into submission every time a white man walks on stage – the wife is forced to invoke the husband when her sanctuary is threatened. “Anytime now, my Joe be home,” she says and we feel the humiliation of it keenly. There is no flab to Purcell’s script. On a second read (Belvoir is issuing the script with the program and long may the tradition last!) several lines resonate even more deeply. “Bury that collar deep”, commands the drover’s wife after they hack off Yadaka’s steel collar with an axe, words symbolic of how Australia has dealt with its black history. She also says: “What’s happened here will be heard as I intend it to be heard.” It’s a desire that may or may not pan out for the drover’s wife but it certainly has for Purcell.